← Is Vienna sausage the same as a Wiener, or a Frankfurter? Semana Santa, or Holy Week, is a BIG DEAL in the Philippines, which only means it is a great time to visit. For meat lovers, however, a word of warning: it is probably the only time when the Philippines turns vegetarian, or fishetarian for the not-too-religious. Being a predominantly Catholic country, Lent is a significant religious festival in most parts of the nation’s 7,107 islands. 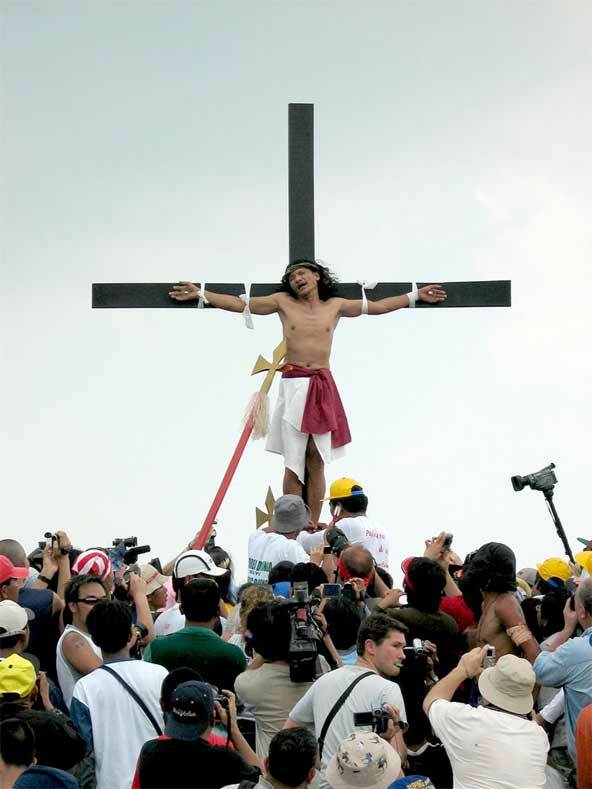 It is elaborately celebrated with gruesome re-enactments of the final hours of Jesus’ life, where real penitents wear makeshift crowns of thorns, whipping themselves in silent processions and ending with crucifixion, for real! 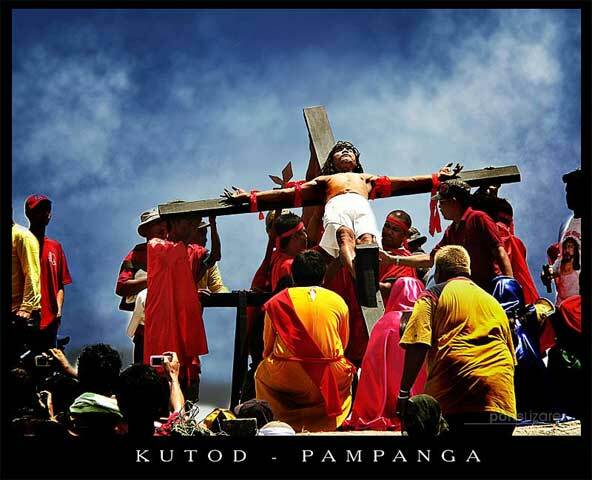 The crucifixion photos on this page were taken in Kutod, San Fernando, in Pampanga province (some two hours away from Manila by car) – the most popular site for the famous rites that draw lots of tourists, and I mean hordes! I compare the sight to watching a bloody boxing match, or a ghastly gladiator fight, as loud gasps accompany every hit on the two-inch stainless steel nail. You know that time when you are not sure if you really want to watch, but you can’t help but look? If you plan to join the ruckus, make sure to apply lots of sunscreen and bring gallons of water, as the Holy Week period is probably the most humid and hottest time in the country, and the combination of dehydration + sunburn is no fun, unless that is your way of repenting for your own sins. But for those of us who prefer the not-so- macabre, there are other spectacles to see. In fact, I can guarantee that you will hear/see/smell/taste the festivities at every street corner, or I will eat glass. Businesses in the Philippines shut down from Maundy Thursday, and TV stations close down or limit their broadcasting hours, which means Filipinos gather in the street for rituals such as processions, visiting seven or 14 churches, known as Visita Iglesia, and pray the Stations of the Cross. Or they simply gather to share and eat meatless cuisines, while they recite or sing the Pasyon or Pabasa – an epic narrative of the passion, death and resurrection of Christ. The really religious (mostly older) people only eat rice, noodles and vegetables throughout the week as their way to repent, while the not-so-religious eat seafood as well. This is the time when people become really creative with their cooking, substituting fish instead of meat, or making a vegetarian dish out of a traditionally pork-populated cuisine. In case you don’t know, Filipinos love pork! Lechon (roast suckling pig) is arguably the country’s national dish. Easter is a whole festival on its own, with the joyous celebration of Pasko ng Pagkabuhay, or the resurrection, starting at dawn with the Salubong. Statues of the resurrected Christ and the Virgin Mary are brought in procession together to meet at a designated area called Galilea, usually in front of a big church that can accommodate a really huge crowd. Mary is veiled in black to express bereavement during the procession, and as she meets the resurrected Jesus, a little girl dressed as an angel and suspended in mid-air sings the Regina Coeli in Latin or in Tagalog, and then dramatically lifts the veil. Other angels would tie the veil to balloons or a dove and release it into the air, signifying the end of Mary’s grieving. 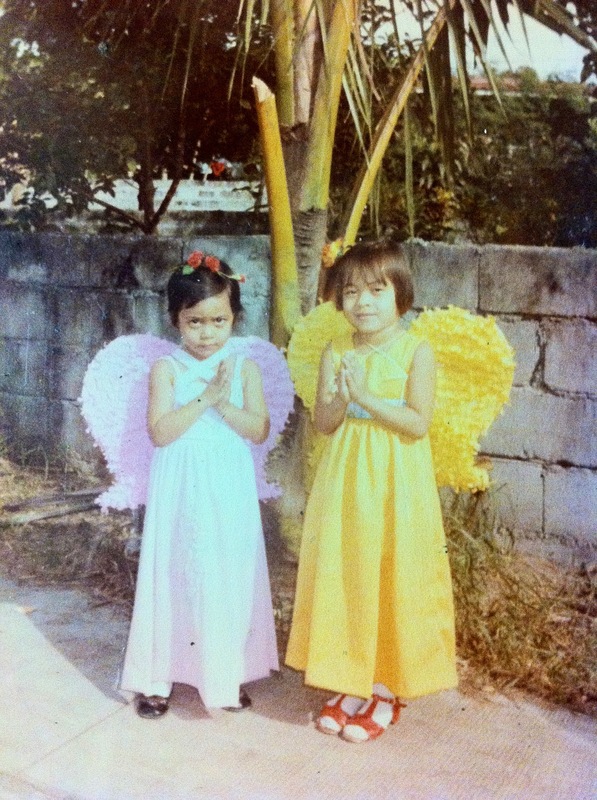 Trivia: I was once an angel at a Salubong procession when I was a little girl in Manila. I’m the one wearing pink! Enjoyed the article? Like us on Facebook, or follow us on Twitter and Pinterest. All rights reserved (Jennifer Ellson). 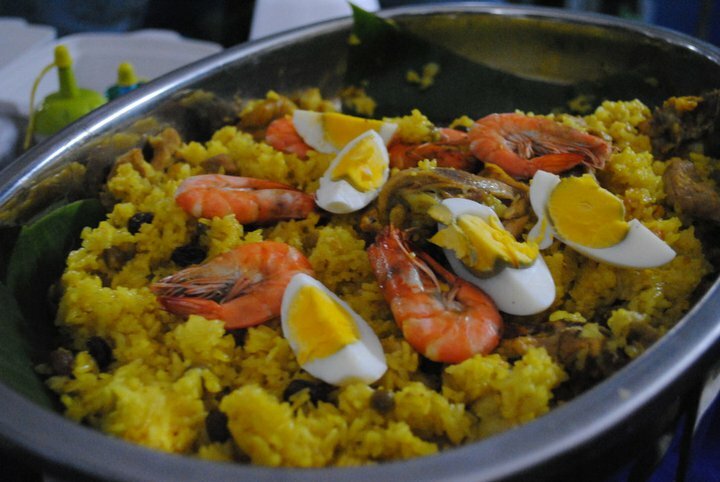 This entry was posted in Asia, Food, Philippines, Travel and tagged Culture, Easter, Holy Week, Jesus, Lent, Mary, Maundy Thursday, Pampanga, philippines, tradition, travel. Bookmark the permalink. You are such a cute little angel! 🙂 Enlightening article indeed.